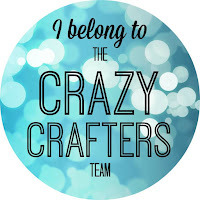 Welcome to the Crazy Crafters blog hop for June. This month we are excited to show off our favourite Stampin’ Up! products from the just released 2015 – 2016 Annual Catalogue. We hope you find great inspiration from the projects. Get your wish list ready! You may just be starting the blog hop here at my blog - Stephanie Fischer - or may have come from the person before me in the list below. If you get off track at any time, the full line-up below will help you move along from blog to blog so you see all the projects. At the moment you are visiting Stephanie Fischer, The Crafty Thinker. It's no secret that I have LOTS of favourites in the new Catalogue but perhaps my most favourite is the Watercolour Wings stamp set. Why? Because it's so versatile and that's what I look for in my purchases! It combines beautifully with Butterfly Basics and both of the matching die sets - Butterflies Thinlits and the new Bold Butterfly Framelits. In fact I love this set so much that I made two projects for this blog hop! 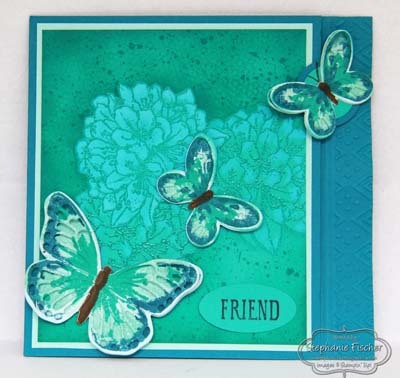 The first is a simple latch card - thank you to Dina Kowal at Splitcoaststampers for the great tutorial. I heat embossed the flower image from Best Thoughts and "reverse coloured" by painting with bleach, using more bleach in some areas than others to for shading and highlights. I stamped the Watercolour Wings butterflies twice, cutting one with the plain die and one with the matching filligree die. I then glued the two layers together at the centre and adhered them onto the floral base, popping up the wings on dimensionals. The colours I used are Island Indigo, Bermuda Bay and Pool Party. 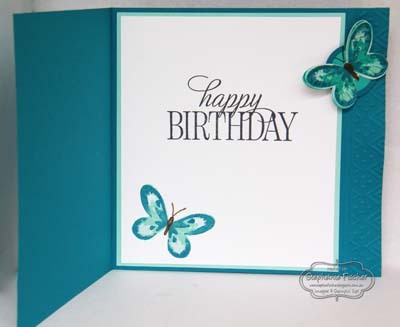 I stamped the butterflies in these colours onto Soft Sky cardstock. The butterfly bodies are Soft Suede. I decorated the latch edge of the card with the Boho Chic embossing folder - using just the end and carefully embossing twice in order to cover the entire length of the card (the only way I could fit it all through the big shot as my card is quite large). The second is a card in a box. I made it with the new thick Whisper White card stock (so it's VERY sturdy!) which I decorated with English Garden DSP and filled with a variety of butterflies and foliage. The sentiment from Watercolour Wings is stamped onto Blushing Bride card and cut out with the Tags & Labels Framelits. I stuck that onto a slightly larger Night of Navy layer. Foliage is from Kinda Eclectic (hand cut) and the Bird Builder Punch. All the colours are drawn from the English Garden DSP. I hope you've enjoyed these projects, I would really welcome your comments. Thanks for taking part in our blog hop, there are so many amazing ideas and inspiration you don't want to miss. Remember that currently you are at my blog - Stephanie Fischer, so check the blog hop line up list to see who is next in the list as you don't want to miss out on seeing any of the blogs and the amazing inspiration they contain. I love the box stephanie. Lovely projects Stephanie, love the butterflies! The card in a box is incredible!! Beautiful projects Stephanie! They are stunning!! Both of your projects are beautiful works of art, Stephanie. Thanks for sharing! Brilliant job!! I especially love the colour choice! Can't wait to get my hands on the new Watercolor Wings set! Love your choice of color for the card. 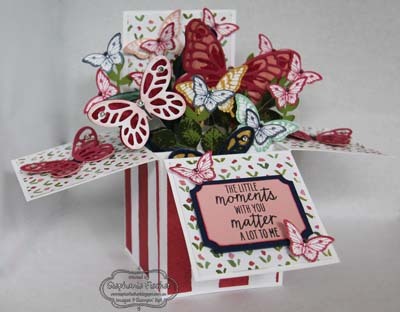 Love your card in a box too and how you filled it full of butterflies. Stephanie these cards are amazing! Definitely going to have to get the Watercolor Wings set. I've got to have everything butterflies - stamps, punches, dies!!! ... and your Projects show how beautiful they can be used. Great choice of colours and card designs. Wow - just beautiful. I love the blues and greens - such gorgeous shading. I really love the butterflies inside the card. Nice touch! Love these cards. I hadn't come across a latch card before. Thank you for the inspiration.